The smallest of the grebes. Rounded head. Body dumpy, rear truncated and tail short. Very small straight bill. No white in the wing in flight. Adult breeding: crown black. Cheeks and foreneck brown-red. Yellow gape visible at the base of the bill. Adult non-breeding: dark brown on the crown and upperparts and pale brown on the rest of the plumage. Shows no contrasting black and white. Bill pale. Juvenile: like non-breeding adult with short dark stripes on the cheeks. Voice: variable, high-pitched calls: “bii-iip” or “bit-bit-bit” which can accelerate into a high-pitched trilling. L. 23-29 cm ; W. 40-45 cm. Similar species: Horned Grebe, Black-necked Grebe. Distinctive shape, with a long body and a long slender neck which may be held erect or lowered. Bill long and thin, paler than in most other grebes. In flight, slim and pale. White neck and black legs which extend noticeably past the body. Conspicuous white areas in front of and behind the eye. Adult breeding: unmistakeable with its head plumes which are raised, opened out and shaken during breeding displays and folded when the bird is alarmed. Bill pale pink. Pairs perform characteristic face-to-face “dancing” during breeding display. 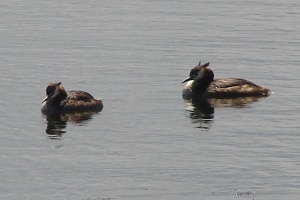 Adult non-breeding: head, foreneck and chest with more white than the other grebes. Mostly white in front of the eye with a black loral line. Juvenile: like adult non-breeding but cheeks with dark stripes. Voice: Very noisy during display. Loud, rolling caw, “kraa-arr”, slowly repeated. L. 46-51 cm ; W. 59-73 cm. 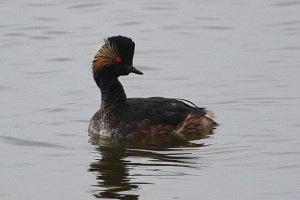 Slightly smaller than the Great Crested Grebe with a thicker neck and often a small crest on the back of the head. In flight, less slender than the Great Crested Grebe with a thicker, dark neck and a smaller white bar on the forewing. Unlike Great Crested Grebe, usually dives by making a definite leap. Adult breeding: unmistakeable due to its colouration. Crown black. Cheeks and throat grey. Neck russet-brown. Base of bill distinctly yellow. Adult non-breeding: blackish crown extending to eye level. Cheeks dull and throat pale. Bill dark with a yellow base. Upper neck mostly grey. Chest whitish. Flanks greyish. Juvenile: similar to the breeding adult by and large, but with dark steaks on the cheeks. Voice: noisy, resonant “gark-gark-gark” and a plaintive, drawn-out “aa-oo-uuh” sometimes turning into a pig-like squealing. L. 40-46 cm ; W. 77-85 cm. Similar species: Great Crested Grebe. 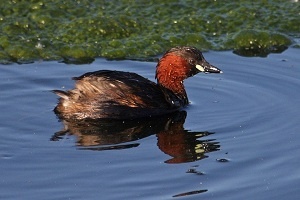 Small grebe of similar size to a teal. Neck relatively long, crown flat and peaked at the rear. Seen from in front or behind, the head looks flat-topped. The bill is straight and short and often shows a pale tip. The unsteady flight recalls an auk, with a veering path and the neck raised for long periods. Adult breeding: unmistakeable with a distinctive head shape, yellow tufts behind the eyes and red/brown neck. Upperparts black and flanks russet. Adult non-breeding: head with clear straight division between black and white, the cheeks being entirely white and demarcated from the black crown above the eye. Small pale line visible on the lores at close range. Short crest on the rear of the head. Juvenile: like the non-breeding adult but with a grey stripe on the cheeks. Voice: weak, tremulous but far-carrying call. Rapid, rhythmic trill during display. L. 31-38 cm ; W. 46-55 cm. Similar species: Black-necked Grebe, Little Grebe. A little smaller than the Horned Grebe with a narrower tail and a dumpier body. Stern distinctly truncated as in the Little Grebe. Forehead steep and crown rounded. Small crest often present on top of the head. Bill upturned, very slender and pointed. In flight, a white speculum extending to the inner primaries and no white mark on the forewing. Adult breeding: unmistakeable. Head, neck and upperparts black. Ear-tufts yellow (sometimes difficult to see from a distance). 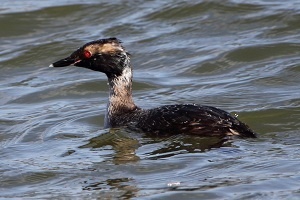 Adult non-breeding: head pattern showing less contrast than Horned Grebe with the greyish of the crown extending well below the eye and forming a dark blob on the pale cheeks. Juvenile: like the non-breeding adult but buffish on the hind cheeks and the neck. Voice: rising “pu-iit” or soft whistling “vit”. Rapid, vibrant trill during display. L. 28-34 cm ; W. 56-60 cm. Similar species: Horned Grebe, Little Grebe.